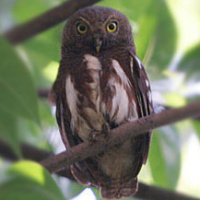 The Javan Owlet is a small owl with a rounded head and no ear-tufts. It is also known as the Chestnut-winged Owlet or the Spadiced Owlet. Distribution: Endemic to Java and Bali in Indonesia. Status: Generally rare, but can be common in optimal habitat. Original Description: Horsfield, Thomas. 1821. Transactions of the Linnean Society of London (Trans. Linn. Soc. London) (1) 13: p. 141. Page by Deane Lewis. Last updated 2015-11-27.